In a slow cooker combine coconut milk, basil, 2 teaspoons salt, 3/4 teaspoon pepper, yellow curry, and chili powder. Stir to combine. Add the chopped red onions, garlic, and jalapeos. Add the chicken and stir to combine. Cook on low for 4 to 5 hours or on high for 2 to 3 hours. Remove the chicken from the slow cooker and transfer to a plate or cutting board. Let cool slightly. Add the ginger to the slow cooker. In a small bowl, combine cornstarch and 1 tablespoon cold water. Stir until smooth, add to the slow cooker and stir. Shred the chicken, return to the slow cooker and stir. Cover with the lid and cook for another 10 minutes. Meanwhile, heat the riced frozen cauliflower in skillet over medium heat. Season with garlic powder, salt, and pepper and cook until any excess water is absorbed. Season chicken with salt and pepper to taste and stir in the cilantro. 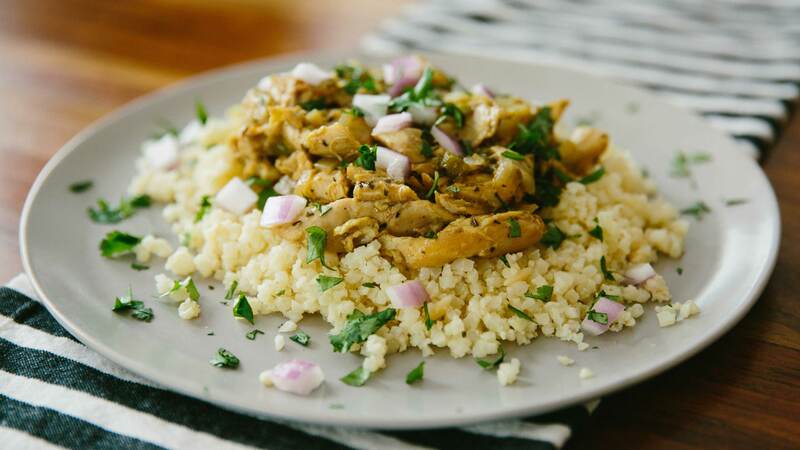 Serve chicken with sauce over cauliflower rice.